On August 18, 2018, the Novi Educational Foundation partnered with the Novi Athletic Boosters & Band Boosters to bring supporters a classic golf outing at Tanglewood Golf Course in South Lyon. 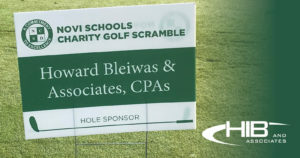 HIB and Associates was proud to sponsor a hole and support Novi school programs in the Novi School District. It was a fun and successful event.